On the checker program review page, you'll find our review of the very unusual checker playing program Blondie24. One of the reasons that the program is unusual is that it is one of a very few "neural net" checker programs, a type of program that "teaches itself" to play. This approach has produced world-class backgammon programs but hasn't done well with non-probabalistic games. It doesn't come close to world-class results in Blondie24 either, despite the authors claim of expert-level play (although it doesn't do that badly either). However, though neural network programming is interesting and different, that isn't at all what makes this program unique. 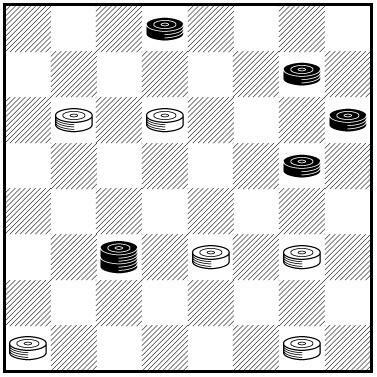 I won't spoil it for you here; just use as a clue the fact that the game is subtitled "Checkers With An Attitude." Take a look at the review, check out the Digenetics web site, and see what you think. 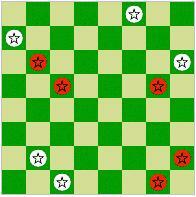 Then, for an objective look, check out this animated game between Blondie and Simple Checkers, showing surprising over-the-board play quality. Ed Gilbert has released version 1.14p of KingsRow, the powerful checker playing engine that lost a squeaker to Cake Manchester last month by the small margin of 1 win, 3 losses, and 630 draws. The new release contains Ed's giant new opening book with over 800,000 positions. Drop in the Chinook 8-piece database, and I bet you don't beat this one over the board. Go here and download your copy right away. A review of the new release will appear on my Checker Program Review Page sometime in early 2005. Undiscovered Draw in Game 5 of Hellman-Ryan, 1949? When your editor was just two months old, Walter Hellman and William F. "Willie" Ryan squared off in Oklahoma City and Joliet, Illinois for the world checker championship. It is a famous match celebrated to this day. One of the checker books that came to our Santa Fe office in the mail this week, World Championship Checkers, is the record of this match. In game 5, Willie Ryan made what was reported to be a colossal blunder, perhaps the worst of his career, and in the end it cost him the championship in this closely contested match (it ended 4 wins each with 42 draws, but Willie was the challenger and so failed to gain the crown). In corresponding with skilled analyst Brian Hinkle, we challenged him with the position at which Ryan blundered. Brian of course figured out the correct move in only about five minutes, but then looked further. He did some detailed computer analysis which appears to show that Ryan's "blunder" actually could have garnered a draw, but he made a real slip some half-dozen moves later, costing him the game! We've been corresponding recently by email with Brian Hinkle, a highly skilled checker problemist and analyst. We send Brian problems that he solves in a few minutes; he sends us problems that we know we will never solve but we try nonetheless. We end up feeding them to a world-class computer program such as Cake or King's Row for analysis. The computer solves them without missing a beat. That brings up the question that is often heard about checkers being "dead." The best computer programs today are at an extraordinarily advanced level, very likely beyond the best human players. 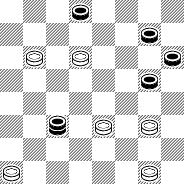 Computer programs were always relatively good in checker tactics; but now, with enormous opening databases of half a million to a million positions, endgame databases which comprehensively solve endgames of up to 10 pieces, computer programs seem to know just about everything about checkers. The University of Calgary has as its goal the complete "solution" of checkers, and they think they will do this in the next few years. We believe that they will, in fact, accomplish this feat. But does the fact that a "solution" for checkers exists (or will exist) mean that the game is "dead"? We think that is only true if you are playing against the world-class computer programs that know the "solution." 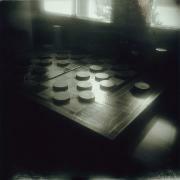 In a game between humans, especially an over the board game, checkers is not and will never be "solved." There is too much challenge and enjoyment in the game as played by mere mortals. What has this got to do with checker problems? It's simply that these problems, especially the better and more clever or entertaining ones, show the depth of the game. Struggle with a couple of these gems and you'll see what we mean. You'll find that there's a lot left for you personally in the grand old game. 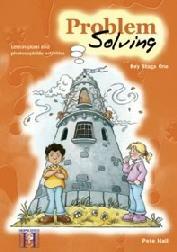 Visit Jim Loy's site and start with his beginner's problems. You'll quickly understand.